It is a new season with a new manager but for Manchester United fans the 2014-15 campaign began in all-too familiar fashion - a depressing home defeat. 'Things can only get better' and 'King Louis is here - United are back' was the message on some of the many scarves and T-shirts on sale outside Old Trafford on Saturday showing United's new boss Louis van Gaal's face as their main design feature. Sadly for the United supporters who saw their side suffer seven home league defeats last season, Swansea would prove those statements to be mostly inaccurate, for now at least. Van Gaal was indeed there, given a rapturous reception for his first competitive game in charge by fans convinced he will bring the glory days back to Old Trafford or, at the very least, back into the Champions League next season. But the optimism of those supporters disappeared during the sort of disappointing display and defeat that became a regular occurrence during David Moyes's year in charge. It was a harsh reminder that, while Moyes has gone, he leaves almost the same team and same problems he struggled with behind. This is a team that finished seventh last season, 22 points behind the champions Manchester City. For all of Van Gaal's impressive track-record, famous self-belief, legendary tactical nous and inspirational man-management skills, he is a football manager not a magician. "Van Gaal has a big job. The Premier League is different. You can see during the game the United players were thinking about where they had to be. When he played 3-5-2 for the Netherlands it was necessity because we had bad defenders. If you were a Swansea player would you have been afraid of that line-up?" But several thousand seemed to think otherwise when the 63-year-old Dutchman emerged from the tunnel before kick-off. Van Gaal got a taste of what to expect when he took charge of United at home for the first time in Tuesday's 2-1 friendly win over Valencia, but the Old Trafford regulars ramped up the atmosphere for his first proper game in charge. He had been greeted by a noisy throng of fans when he stepped off the team bus, giving a quick wave of his famous folder by way of hello, but he had little time to take that in. It was different inside the ground, where there were no banners to welcome him, just a wall of noise from about 70,000 home fans who were all on their feet. On his walk along the touchline to the dugout, Van Gaal gave a cheery thumbs up and a wave to the fans nearest to him. Unlike on Tuesday, there was no autograph signing this time - it was time to get down to business - but he did take time to look up and around him to take in his surroundings. He had written in his first programme notes that the greeting he was given before the Valencia game was so good it gave him goosebumps, but the sheer volume of Saturday's reception might just have surprised him again. United's long list of injured and unfit players, as well as summer departures and a shortage of new signings, meant Van Gaal had to turn to youth for his first competitive United line-up. Two locally born academy graduates, defender Tyler Blackett and midfielder Jesse Lingard, came into his team so Van Gaal could stick with his favoured 3-5-2 formation. On paper, this was a positive thing. After all, the Dutchman has had a reputation for developing young players since his Ajax days, and United have a rich history of bringing players through their ranks. In reality it exposed how thin United's squad is at present, in terms of both quality and personnel for the way Van Gaal wants to play. His side actually began the game well, with new skipper Wayne Rooney a bundle of energy and Lingard, employed as wing-back darting up and down the right flank. But Swansea seemed to be soaking up the home pressure all too easily, and were also looking dangerous on the break, something they made the most of when Ki Sung-yueng was allowed acres of space to fire them into the lead. United fans might have to get used to it. When he was asked about it after the game, United's defensive vulnerability in the first half was something Van Gaal seemed to accept came with wing-backs, a three-man defence and a high defensive line. "Every team will create chances against us because we are playing with a big space behind us which is always very difficult to defend," he explained, before going on to say he would not be changing anything in the future. Swansea were certainly not complaining. Van Gaal barely moved a muscle on the touchline when his team fell behind, and in fact stayed rooted in his seat throughout the match. He looked cool and calm and did not rant and rave at half-time either, when he made a substitution - Nani for Javier Hernandez - and switched formation to 4-2-3-1. "We were not playing well and we were behind, so I changed the system to one they have used a lot at United before," Van Gaal said afterwards. "During the break I always look to the future so I talked only about the change of system and how they have to act in that system. That is what you have to do in that situation, you have to help your players." Initially, it seemed the renowned tactician had done it again. United emerged a more fluid attacking team and soon equalised through Wayne Rooney's acrobatic volley. Sadly for United, their momentum petered out and, thanks to more uncertain defending, Gylfi Sigurdsson sealed the three points for Swansea. 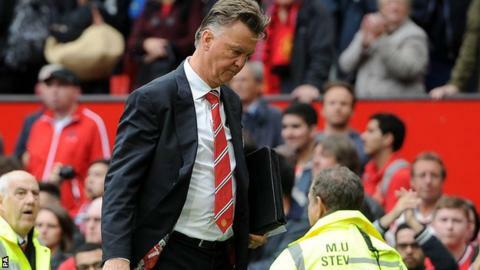 Van Gaal put a positive spin on the outcome of his first game but there was thinly veiled criticism among his praise for his players' efforts. "I told them in the dressing room that I could not say they hadn't tried their utmost," he said. "It was unbelievable what a fantastic mentality they have shown. "But reaching the level we want is something different. That is not only running, but also to use your brain and then you can play like a team. In that aspect, we failed today." There was nothing downbeat about the Dutchman in defeat but he definitely saved the spikier side of his personality for the press, who pushed him on how urgently reinforcements were needed. When asked by one journalist how many players he would like to bring in before the window shuts on 1 September, Van Gaal replied: "No I will not discuss that with you. "I am sorry but I was asked the same question when I was in my press conference on Friday and I gave the same reply. I believe you were in that press conference because I remember your face." What is not in doubt is that new players are needed but, in the meantime, at least some old favourites are on their way back. Robin van Persie was not considered fit enough to feature against Swansea because he reported back late from the World Cup, but Van Gaal confirmed he is "closer to selection now". When that happens, and also when the promised signings are made, maybe the slogan on that scarf will be true after all. Until then, it appears not even 'King Louis' can make the difference that the United fans demand.